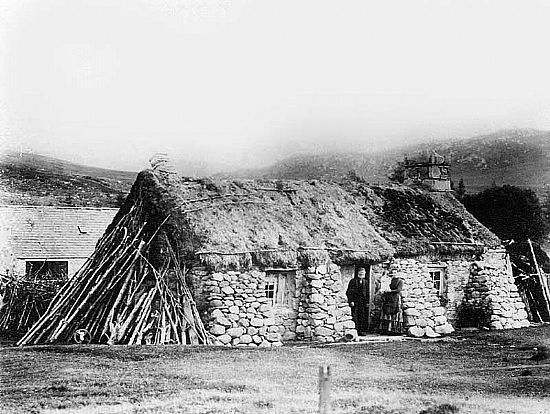 The thatched house shown here ("taigh dubh" or "blackhouse") would have been one of the last to survive on the Dunmaglass Estate. Immediately behind can be seen the new type of house - the slate-roofed "white house" (or "taigh geal"). Blackhouses were known to be very warm due to the thickness of the walls and the depth of insulation in the roof above. Once inside, even a storm was barely noticeable (provided the turf/thatch roof was well maintained). They would, however, have been a haven for small rodent life and other creepy-crawlies! The blackhouse was a model of environmentally-friendly building design. Virtually all materials came from the surrounding landscape and blended with the scenery. These houses, on becoming vacant, would rapidly deteriorate and "melt" back into the landscape. Within a few short years of abandonment, many would be identified merely by an outline of stones emerging through the rank grass or bracken. Many former blackhouses (often in communities of several houses together with outbuildings) are now lost from the landscape - the greater proportion of these now hidden from sight within the great expanse of exotic conifer forests now covering the drier hillsides where earlier Strathnairn communities tended to be located. The arable croft land, alongside these houses, that had been taken into cultivation following generations of back-breaking labour and toil by long-forgotten natives of Strathnairn, so often lies hidden amongst these dark, lonely woodlands, never to raise crops again. Many Highlanders, who had formerly resided in blackhouses, would later remark that the white house - while convenient in many ways and spacious - was a cold house to live in compared with the blackhouse. Interestingly, one occupied blackhouse still exists in Strathnairn today (admittedly with a corrugated zinc covering above the thatch and all the modern conveniences one would expect of the 21st century below). Another Strathnairn blackhouse survived until 1993 (when it was accidentally burnt down) but has now been renovated and rebuilt - thanks to the generosity and neighbourliness of the present Strathnairn community - and continues to be occupied by the original inhabitant.